Cordless tools are used for hassle free work and to avoid getting caught in between wires while at work. Makita, one of the leader in producing high quality tools and equipment for rugged use, bring you their range of cordless combo kits. Reliable and durable are some synonyms for products from Makita. This range of Makita cordless combo kits comprises of models such as LCT200W, LCT400W, LCT300W, LCT302W etc. 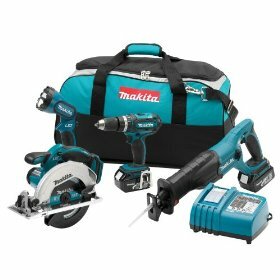 This series of combo kits from Makita include lithium-ion batteries, 15 minute rapid charger, 18 V compact driver drill, Impact driver, and a contractor bag. The LCT300W also comprises an 18V rechargeable flashlight. In addition to all this, the LCT400W model also comes with an am/fm job site radio. Merits experienced by users for these Makita combo kits are ample, such as, light in weight and the LED feature comes in handy. The 15 minute charger does its work beautifully. The drills deliver fantastic power and torque. For the price and weight these compact drills make a good buy. Demerits for these Makita cordless tools are the battery run time is a bit disconcerting. The base is not very stable because they are light in weight. The compactness of the drill hampers the space to grip the drill. A lot of drilling with these Makita cordless combo kits leads to the batteries becoming hot, which also take a long time to cool down. These combo kits by Makita include models LXT 702, LXT407, LXT211, LXT218 etc. This range of Makita cordless combo kits come in 2-piece, 3-piece, 4-piece, 6-piece, 9-piece, 15-piece combo kits for its various users and various carpentry needs. Some common items are packed with gadgets like 2-speed Hammer Driver drill, Impact driver, built-in LED light, a rugged tool belt clip, lithium-ion battery with the Energy star rated 30 minute rapid charger. The pros for these Makita combo kits are the light which can illuminate a room itself. Swazall blades which need not be changed many times, lead to consumer satisfaction. The circular saw cuts through 2x4 materials smoothly. Users find this combo kit very convenient, reliable and long lasting. The cons for this line of cordless combo kits are the portable radio works well, but sometimes one has to move it around to find good reception and sound. Some users have complained about the Swazall blades which are slow as compared to the other brands in the market, and the batteries do not hold their charge for a longer duration. Consumers would also prefer the light on the drill focused on the screwdriver tip better. Being a consumer and having so many options to choose from is tough. Hence a good decision like one might know would be, to choose a tool that could deliver well for your requirements and not punch a hole through the pocket. Reliable, durable and comfortable are the major assets for Makita products. Makita cordless combo kits are recommended for construction workers and for house-hold projects. Therefore, owning this bag of Makita combo kits would serve to every building and renovating needs that one has. Return From Makita cordless combo kits Page to Home - Finishcarpentryhelp.com.